Defender Brendan Moloney says the Cobblers players are ‘buzzing’ ahead of Saturday’s Sixfields showdown with struggling Millwall (ko 3pm). After two defeats on the bounce, at the hands of Bristol Rovers in Sky Bet League One and then Coventry City in the Checkatrade Trophy, Town stopped their mini rot when they secured an excellent point with a 1-1 draw at leaders Scunthorpe United on Saturday. They did so despite playing the final third of the match with only 10 men following Matt Taylor’s sending off, and Moloney admits the result at Glanford Park allied with the team’s impressive start to the season means the players are in good spirits. Town will go into Saturday’s game as favourites as they are currently sixth in the table while the Lions, who were beaten in the play-off final at Wembley in May, are stuck down in 19th place, and without a league win since August. But Moloney says although the Town players are on a high, they won’t go into the game with any sort of complacency. “Millwall were in the play-offs last year, and although they haven’t got off to the best of starts we know that things maybe just haven’t been clicking for them so far,” he said. “They have a very strong squad, and I think in any game in this division, if you’re not at it, no matter who you are playing and whether they are top or bottom of the table, teams will cause you trouble because there are good players in this league. 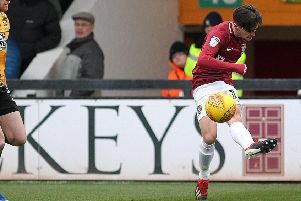 A big crowd is guaranteed at Sixfields, with Millwall having sold out their 944 allocation for the south stand, and Moloney is looking forward to the occasion. “The atmosphere (at Sixfields) has been great this season, and we expect the same on Saturday,” said the Irishman. “Obviously we lost our last home game, we don’t want that to happen again, and we will doing everything we can to make sure it doesn’t. “We were disappointed with the match against Bristol Rovers, and we conceded some sloppy goals which isn’t like us. The Cobblers will be forced into one change due to Taylor serving the first game of his three-match suspension. There are no injury concerns, with Harry Beautyman available after missing the Scunthorpe trip with a knee problem, and Gaby Zakuani is also back in the frame after his return from international duty. Millwall could field three ex-Cobblers in their starting line-up. Steve Morison is set to lead the line, while also likely to play are goalkeeper Jordan Archer and central defender Byron Webster.